“I’m sure I can push a termite inspection off by a couple months”, a phrase often said by people that dig themselves into thousands of dollars of debt by neglecting signs of termite infestation. Timber can be treated to prevent termite attack, and some timbers are naturally resistant – use treated or naturally resistant timber when it is in contact with, or close to, soil. If you think that some of your timber needs to be treated, organize one of our termite inspections for peace of mind. Termites and water go hand in hand, without it they can’t survive. Fixing water pipes that leak and draining pools of water near structures will help eliminate local colonies. Termites love humid environments, so make sure that sub-floor ventilation is adequate and minimise water retention and improve drainage in this area. It is well known that white-ants (termites) can’t chew through concrete, but enter through cracks so make sure that the concrete slab is compacted, and properly cured. Another fact is that termite colonies can sometimes be located within 100 metres of building structures. Colony detection and elimination is the best way to protect your home from infestation. Regular termite inspections are the most important part of controlling termites before they do any damage. In Sydney, Australia, arrange regular inspections for more effective termites control – at least once a year in cooler areas and twice a year in warmer areas. I remember years ago before I even started in the pest control industry, finding termites in my own back yard. I was alarmed, and then quite angry that termites had been chewing on my back yard fence-line. A bush had overgrown over the fence and had provided what was an excellent environment for white ants (another name for the critters!). They had a shady, wet, secret undisturbed area where could munch away on my fences. In a rage I ripped away the bush looking for the mongrels that were costing me my hard earned money. Lucky for me they had only started foraging and once disturbed went back to my (unlucky) neighbours home. I ended up getting a termite inspection from a local firm, which found no termite activity in any area of my property. They never returned until some 12 months later. Thankfully I had already sold my home and moved away. My old neighbours said that the new owner found them returned under a verandah, and it apparently cost them over $4,000 for the treatment. Especially now that it’s warming up home owners should be aware of the importance of termite and pest control. Even though control of termites can be tricky, I learned from this that changing the environment can make a big difference to keeping termites at bay. IT’s very important to know the basics about how to control termites. We are so confident of our work that we are able to provide a Five (5)Year Warranty to 95% of our termite work for active termites or termite protection as a preventative measure against white ant attack. It is a condition of warranty that we regularly inspect completed work so that we can monitor any changes in the environment. Please call Bruce, an expert termite inspector, on 0417 251 911 for any questions about termites. Top: a termite worker. Middle: termite worker gut. Bottom: arrows point to spirochetes and “P” a protozoan. More closely related to the Order Blattaria, termite soldiers possess a generally rectangular head capsule with species distinct mandibles. Workers are notable for a broadly joined thorax and abdomen. As their Order signifies, winged reproductive termites or alates possess two pairs of opaque, linear, thin, and equal-sized wings. 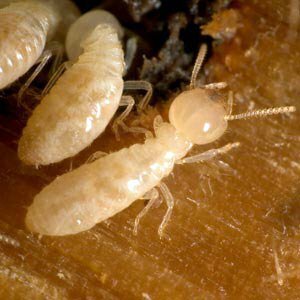 Living in a colonial and “socially ranked” system, all termite castes are bisexual. It is thought that determination of caste is post-ovum emergence. 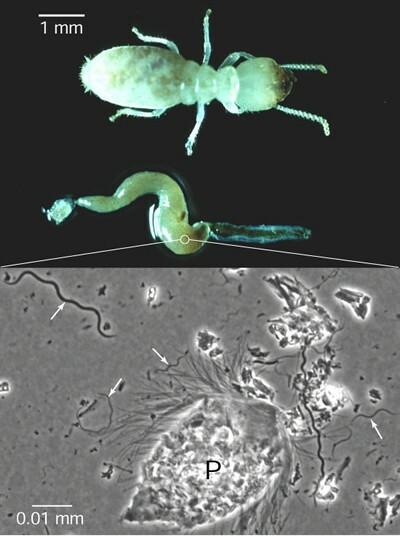 Via trophallaxis, nymphs receive hormones secreted from reproductives and soldiers that limit development to a specific caste. While other castes are repelled, light and air currents stimulate alates. Postnuptial flights, alates shed wings and in pairs attempt to found a new termitarium. professional pest controllers are trained in inspecting houses for termite activity. Only used licensed and termite accredited technicians. home owners can inspect houses themselves more frequently than a professional, if they can identify termite activity. We can show you what we are looking for, just ask us at the time of the inspection, you’ll be better off knowing how to termite control with a bit of information from one of our specialists.